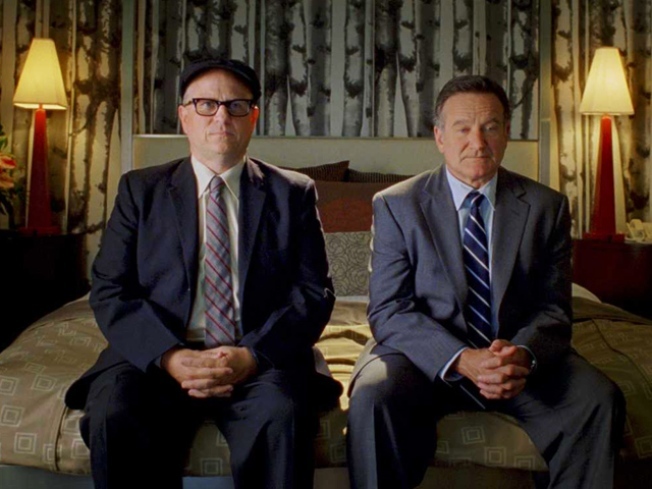 9/8: Robin Williams is "World’s Greatest Dad"
Robin Williams heads into black comedy with "World's Greatest Dad." DADDY ISSUES: Mrs. Doubtfire, indie? We never thought we’d see the day. But as a middle-aged man with an insufferable son (Daryl Sabara), a girlfriend who’s ashamed to tell people they’re dating (Alexie Gilmore) and a pocketful of unrealized dreams – who then is faced with an unbelievable opportunity as wrong as it is right -- Robin Williams goes deep (and doesn’t even do any funny voices!). Bobcat Goldthwait’s darkly funny “World’s Greatest Dad” is playing at Cinema Village at 9:50PM. POWER TRIP: In “The Promise of New York,” a stand-up comic, a high-school math teacher, and a “political gadfly” compete against each other and controversial candidate Michael Bloomberg in the 2005 mayoral elections. As you might expect, the three have their eyes opened about the democratic process. Timely! Writer-director Raul Barcelona will be on hand for a Q&A. Monkeytown, 8PM. OUI HEART HER: At Florence Gould Hall, Charlie Rose will host a screening of the documentary “Juliette Binoche, Sketches for a Portrait,” an intimate look at the actress’ life and artistic process made by her sister, Marion Stalens. She and Binoche will be on hand to discuss – just one part of the actress’ busy NYC schedule this month. 7PM.